The original Bethesda Home in Vineland, with an addition. Photo courtesy of the Centre for Mennonite Brethren Studies. Bethesda (formerly Bethesda Mental Hospital) of the Ontario Mennonite Brethren District Conference was located on a farm near Vineland, Lincoln County, Ontario. It began as a private enterprise by Mr. and Mrs. Henry Wiebe who had come to Canada in 1924 and who had formerly worked in the mental hospital Bethania, Ukraine, Russia. Having an understanding for the lot of the mentally ill, they desired to continue to serve in this field. 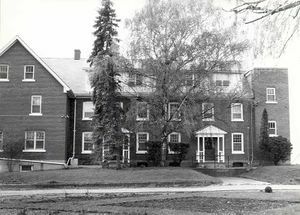 In 1932 they took the first patient into their home at Stratford, Ontario. To accommodate more patients, they purchased the farm near Vineland with large buildings in 1937. The home was supported by voluntary contributions until 1944, when the Ontario Provincial Conference of the Mennonite Brethren Church bought it. At this time the institution was registered with the government as a private sanitarium. In 1947 the Canadian Conference of Mennonite Brethren Churches took over the supervision of this institution. In 1949 this home had 22 patients cared for by a staff of four practical nurses, one orderly, and one part-time registered nurse. Mr. and Mrs. Wiebe were the supervisors. In 1949 only nonviolent patients were admitted. The Conference planned to construct a modern building with the capacity for 30 patients and with facilities for treating more patients. In 1966, Bethesda expanded its services to include individuals with a developmental disability. Over the next decade, there was a shift to providing a variety of supports to those with special needs. By 2009 almost 400 Bethesda staffpersons supported over 1100 individuals from the Niagara and surrounding regions. Bethesda Services. "About Us." http://www.bethesdaservices.com/aboutus (accessed 14 August 2009). Thiessen, I. H. and Sam Steiner. "Bethesda (Vineland, Ontario, Canada)." Global Anabaptist Mennonite Encyclopedia Online. August 2009. Web. 26 Apr 2019. http://gameo.org/index.php?title=Bethesda_(Vineland,_Ontario,_Canada)&oldid=146975. Thiessen, I. H. and Sam Steiner. (August 2009). Bethesda (Vineland, Ontario, Canada). Global Anabaptist Mennonite Encyclopedia Online. Retrieved 26 April 2019, from http://gameo.org/index.php?title=Bethesda_(Vineland,_Ontario,_Canada)&oldid=146975. Adapted by permission of Herald Press, Harrisonburg, Virginia, from Mennonite Encyclopedia, Vol. 1, p. 317. All rights reserved.